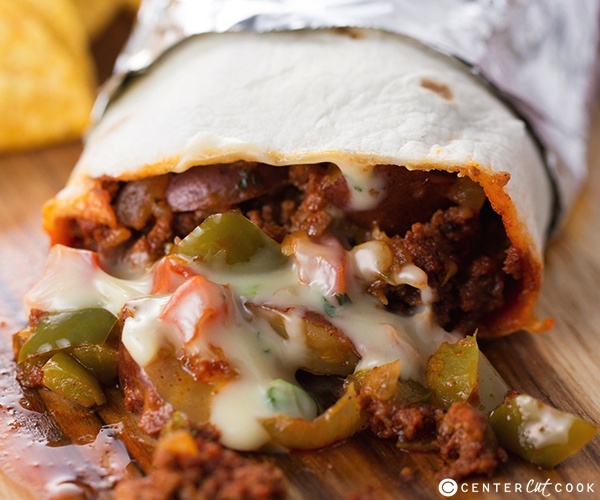 Spicy chorizo, potatoes, and queso blanco come together to create flavorful, delicious Chorizo, Potato, and Queso Burritos! 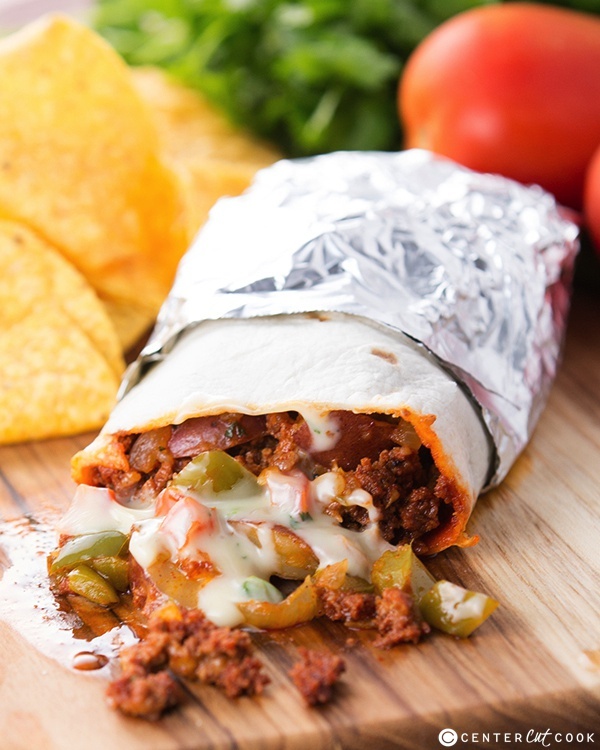 These Chorizo, Potato and Queso Burritos sound complicated to make but they are actually super simple and made entirely in one skillet! From start to finish, it’ll only take you about 30-35 minutes. Hard to beat, right? 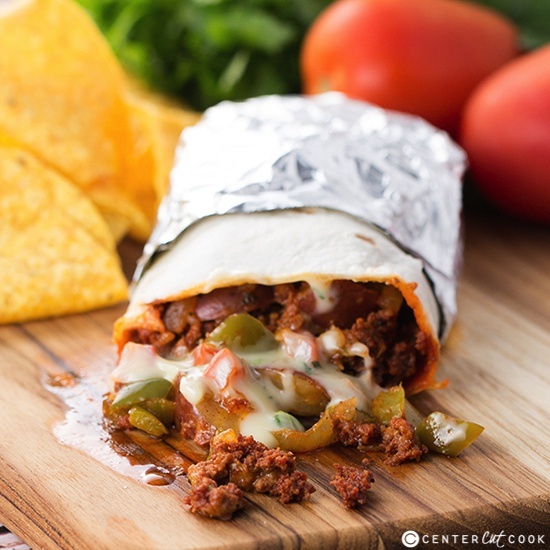 The inspiration for these burritos comes from the fast causal restaurant Qdoba. My husband loves a breakfast burrito that they sell with eggs, chorizo, potatoes and queso. I decided to make something similar, just without the eggs for dinner. Chorizo seems to be one of those meats that the general population doesn’t cook with often. I know I don’t, but I should. It’s super flavorful and works perfectly in so many recipes (chorizo quesadillas anyone?). For this recipe, I decided to go to a market that sells a wide variety of products from Mexico because I wanted Mexican chorizo instead of Spanish chorizo. From what I can tell, the Mexican version is spiced with chile peppers while the Spanish version is spiced with paprika and garlic. There’s also a difference in consistency with the Mexican version being crumbly and the Spanish version being more firm and cured. The market that I went to sold fresh Mexican Chorizo, and when I took it out of the casing I was left with ground chorizo that was super simple to work. Another ingredient in this dish that you may not cook with regularly is green poblano peppers. They sell so many different types of peppers at the grocery store these days that sometimes it’s hard to know which ones are sweet and which ones are spicy! All you need to know is that green poblano peppers are mild and definitely family friendly. On a heat scale of 1 to 5 with 5 being the hottest, I’d give green poblanos a 1. You prep them, just like you would a green pepper by scooping out the seeds and removing the “ribs.” If you can’t find poblano peppers, a green pepper will work just fine. One of my favorite ingredients in this entire recipe is the homemade queso! I include a link to my recipe below. It pulls all of the flavors together perfectly! Of course you can use store-bought queso but the homemade version is awesome! Rinse potatoes and pierce them with a fork. Place on a microwave safe plate and microwave for about 5 minutes to get the cooking process going. Alternatively, you could place them in a saucepan, cover with water, and bring to a boil, then cover and remove from heat and let stand for about 5 minutes. Once the potatoes are partially cooked, cut them into small cubes. In a large skillet, begin browning the chorizo and breaking it up. After cooking the chorizo a few minutes, add in the diced poblano pepper, and diced onion. Continue cooking until the chorizo is cooked through and the peppers and onions are tender. Remove the chorizo, peppers and onions from the pan. Adjust the heat to medium-high and add 1 tablespoon of oil to the pan. When the oil is hot, add in the diced potatoes, salt and pepper. When the potatoes are lightly browned and completely cooked (about 8-10 minutes), add in the chorizo mixture. Stir in cilantro. Remove the chorizo/potato mixture from pan and wipe it out with a paper towel. Adjust the heat on the skillet to medium-low and heat the tortillas, one at a time, for about 20 seconds per side. Using a skillet to heat the tortillas has always provided better results than microwaving. Begin filling the burritos with about 3/4 cup of the chorizo/potato mixture. Top with homemade warm queso, and then roll-up. If you’d like, cut each burrito in half on a diagonal. This recipe yields at least 6 burritos, possibly more depending on how full you fill each one.